An image from an onboard camera during Discovery's launch shows the chunk of foam that has led to a grounding of the fleet. The picture was released July 27. WASHINGTON - NASA is leaning toward flying its next spaceshuttle mission without the protective foam ramp that broke away fromDiscovery's external tank during its July return to flight, according to aspokesman for the U.S. space agency. Shuttle officials plan to meet again this month to evaluatethe Protuberance Air Load (PAL) ramp issue and possibly reach a decision. "The data from the ongoing engineering analysis on thePAL ramp seems to be pointing in the direction of not flying with the PAL rampfor STS-121," said NASA spokesman Allard Beutel, referring to Discovery'snext mission, tentatively slated for May2006. Beutel said eliminating the PAL ramp would not in and ofitself jeopardize the May launch opportunity, provided that wind tunnel testingnow being planned for February confirms that it is safe to fly without thestructure. The PAL ramp was added to the external tank early theprogram's history to provide a windbreak for a cable tray that runs along thetank. NASA Space Shuttle Program Manager Wayne Hale raised thepossibility of eliminating the ramp from the STS-121 tank during a Nov. 22 updateon work the agency has done to eliminate foam shedding. "In the long run, we have decided we would like toremove this fairly large piece of foam, just eliminate the hazard that it mightcause," Hale said at the press briefing. "We think we have a verystrong case to be ready to take that ramp off by the third flight tank. Somefolks believe we can accelerate that and potentially even remove it for the STS-121tank." Several days after that press briefing, Beutel said, shuttleofficials received new data that showed that recently discovered PAL rampcracks on tanks undergoing inspection ran deeper than previously thought. 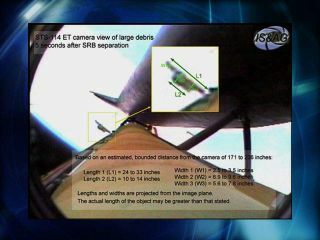 Thenew data persuaded Hale that NASA should give serious consideration to removingthe PAL ramp before STS-121. Hale shared this view with colleagues in a Nov. 29e-mail first reported by the Washington Post. Hale's Nov. 29 e-mail said nothing about schedule impact,according to Beutel, but in a separate internalmemo, written in early September in the immediate aftermath of HurricaneKatrina, Hale concluded that flying STS-121 without a PAL ramp was not arealistic option since all the testing and analysis involved would delay themission until late 2006. Beutel, however, said shuttle officials now think they cansafely remove the PAL ramp without forfeiting the May launch window. "They've had a couple more months to work this andafter studying this problem up and down the chain they are thinking that thePAL ramp removal is more feasible than they did just a couple of monthsago," Beutel said. Wind tunnel tests are being planned for February to evaluatethe aerodynamic effects of removing the PAL ramp. In order to preserve the Maylaunch window, Beutel said NASA would go ahead and ship the tank assigned toSTS-121 to Kennedy Space Center in Florida without a PAL ramp. "If, and only if, our further testing and analysissupports flying without a PAL ramp is aerodynamically alright to do, as ourpreliminary analysis indicates it would be, then the May launch window is stillpossible to make," Beutel said. "If our new testing and analysisindicates we need the PAL ramp, we'll stop our shuttle processing, reassess andwork the issue from there." He saidNASA would also continue to investigate new ways of applying PAL ramp foam toprevent cracking that could cause the structure to break off during launch.